Red Bull's Daniel Ricciardo hopes he can challenge Mercedes and have a "proper title fight" in 2015. 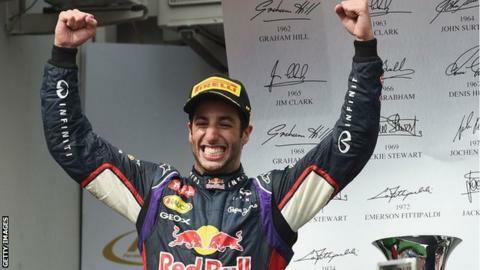 The 25-year-old won three races in 2014 - the only non-Mercedes driver to win - and was third in the championship, behind Lewis Hamilton and Nico Rosberg. "When you look back it was pretty awesome how we won three when they were so dominant," said the Australian. "The target is to win more races and hopefully get more results in a title fight - a proper one." Ricciardo will drive the new Red Bull on the first two days of the first pre-season test in Jerez, Spain from 1-4 February, in only his second season with the team. He hoped the significant power advantage Mercedes' engine had in 2014 will mean they cannot make as much progress in 2015. "Everyone is going to improve, that's a fact," said Ricciardo. "But you'd like to think that Mercedes' room for improvement is smaller than everyone else's. "I hope they don't have another 50% on top of what they've got and I think us and Ferrari can make up that gap." Renault are said by insiders to have improved their engine by about 50bhp over the winter. This would leave them still a little short of the power output of last year's Mercedes engine but the decision to allow all manufacturers to do limited in-season engine development gives them the opportunity to close further. Ricciardo added: "If we can halve the performance gap, it's a good start and then we can apply pressure as the season goes on. "Everyone is trying to improve, and I'm aware of the need to keep improving. I expect to be quick." On the other leading teams, Ricciardo said: "I expect Williams to be strong. The big question mark is McLaren-Honda. I'm very excited to see how they go." Honda are returning to F1 after a six-year absence as engine partner to McLaren, with an all-star driver line-up of Fernando Alonso and Jenson Button. "They have the potential to do well," Ricciardo said. "Everyone will be watching to see what kind of step they can do. "With Ferrari, there is no real sign they can gain a second a lap. McLaren, they could gain a second if it all gels with Honda." Red Bull will be without four-time world champion Sebastian Vettel following his move to Ferrari, but team boss Christian Horner said he believed his replacement, the Russian Daniil Kvyat, would prove to be a star. "In Kvyat we've got a really fast, determined, intelligent driver," Horner said. "There will be the odd mistake but that's natural with a young driver. He can be surprise of this year in the same way that Daniel was last year. He has the attributes to do some really fantastic things." Horner admitted Mercedes "start as favourites" but said his team would "make significant inroads hopefully", adding that "Renault are taking an aggressive development approach". Mercedes are believed to have added at least 50bhp to their own engine, but the truth will not emerge until the first race weekend of the season in Melbourne, Australia on 13-15 March.